Do you ever wonder what to do with your old French (or Italian) bread after a day or two? Have a ton of breadcrumbs already? Want an alternative to ordering crappy delivery pizza on game day? 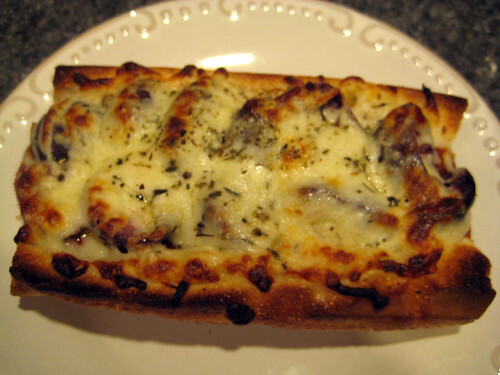 Rejoice friends, for my Day Old French Bread Pizzas are your salvation from the ordinary and from tossing perfectly awesome bread. I did this for my Gorumet From the Tailgate series this week, because I had leftover French bread from pasta night. It’s really hearty, filling and the best possible alternative to delivery. 2. 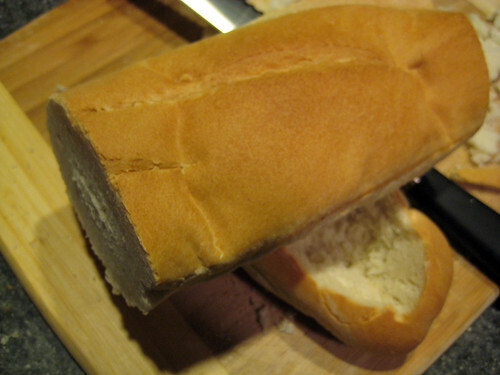 Slice your 12-inch section of bread into equal halves. Then, carefully slice off the upper crust vertically. Use a spoon to dig out the soft insides and the edges. Be careful not to break the crust (which should be firm since this is day or two old bread), as it will be the reservoir for your sauce and toppings. 3. Lay down a base layer of pizza sauce (I use about a 1/8 cup toppings, and another 1/8 cup per section of bread), followed by your toppings of choice. 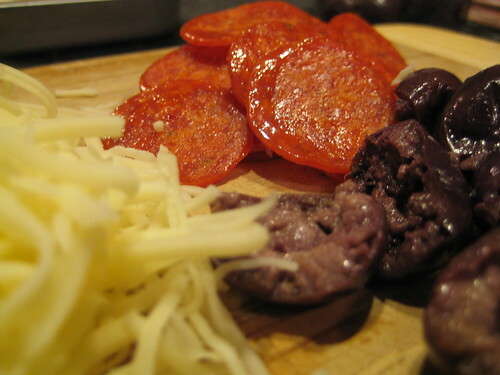 I used spicy pepperoni and Greek black olives. Then, use the rest of the sauce to pour over your toppings. Layering your toppings in the center, assures that the sauce will warm them from both sides during cooking. 4. 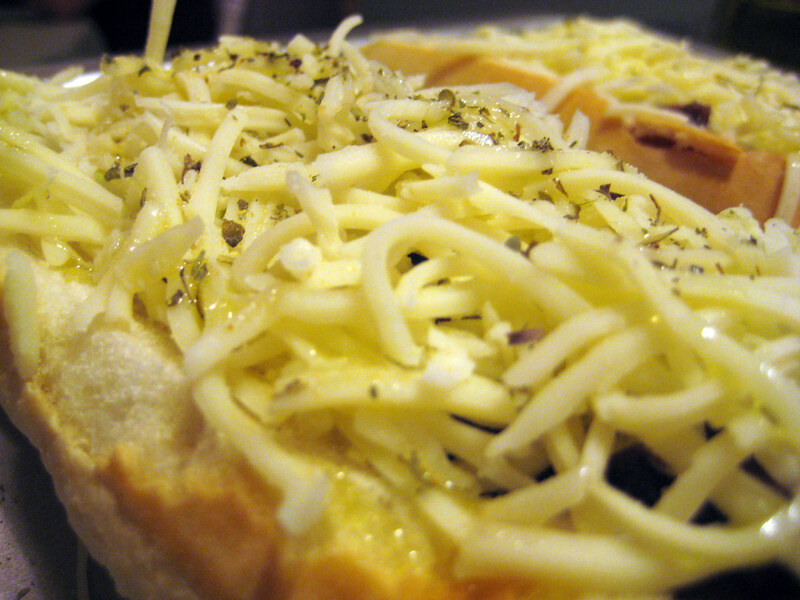 Toss on your Mozzarella over the top, drizzle it with olive oil and then lightly spread some garlic salt over the top. Place it on the center rack of your oven or a cookie sheet. Cook for 6 to 8 minutes. These little pizzas are awesome. By hollowing out the French Bread, you have a little deep dish area for a ton of sauce. I’m huge on sauce and even bigger on toppings, so a 6 inch area can be really filling if you pack it in. Alas, the Lions are still not performing as efficiently as my ovens. We’re 0-4 folks, with little hope of recovery. At least the Red Wings will provide me some excitement soon! Entry filed under: Gourmet from the Tailgate, Our Recipes. Tags: Food, Home Cooking, Italian, Pizza, Recipes. I normally make a bread salad out of old Italian bread. This looks like a great alternative!